“Today I am going to walk along the bottom of a Lake”, What’s your plan? Sounds bizarre I know but a 10km hike along the bottom of a lake is exactly what is going through my mind. Walking along the old canal path submerged since the 1930’s, viewing the remains of the old locks and lock keepers cottage’s and imagining the lives of the inhabitants. The skeletons of trees, once showing off their shiny new covering of crisp young leaves, will now be appearing as architectural structures in the mire of the morning mist. Lac de Guerledan just 50 mins from our haven of tranquillity is the largest manmade lake in Brittany with a surface area of 4km sq. The dam by which it was created was constructed between 1923 and 1930, beginning its life just as the Great depression was taking hold in America and in the year that Masking Tape was invented. Its purpose, to provide a supply of drinking water for Morbihan in Central Brittany but primarily the energy for a hydro electric power station. This lake dissects the Nantes Brest canal which cuts through the centre of the Bretagne countryside. This section of the canal followed the Blavet river heading towards the atlantic ocean at Lorient. Ok, so I might not be going to put on my diving gear to experience my sub aqua adventure. The Lake is currently being drained for maintenance on the Dam, something EDF have to look at every 10 years. This is probably the last time this old canal path will be exposed as they are putting in the facility to check and repair the dam without the need for draining the lake in the future. The last time this happened in 1985 thousands of people took the opportunity to explore the strange lunar like scenery appearing from beneath the water. For me the opportunity for some atmospheric photography is just too good to turn down. I hope to be making several visits during the 6 months, beginning in May, that the lake will be drained. Opportunities exist to walk the route independently or pay a small fee to go on a guided tour. It only happens once every six years and I expect it only happens in 30 degree heat for one in six of those. 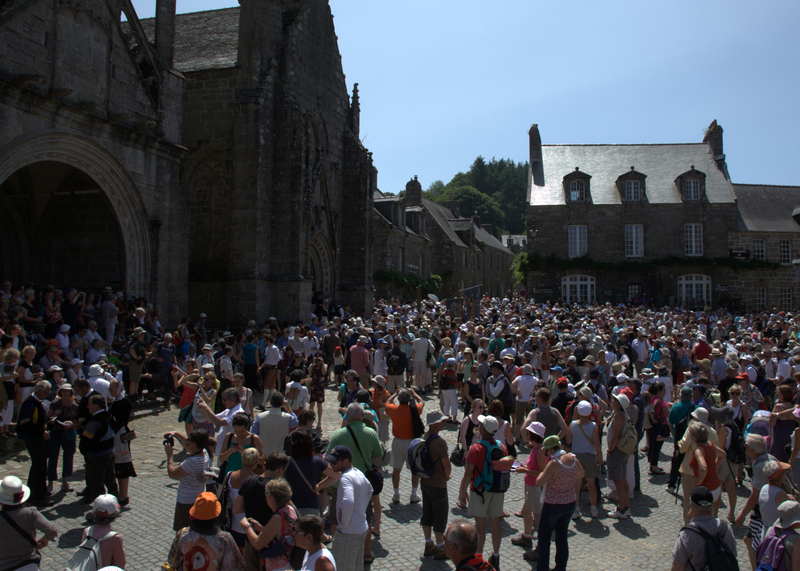 You have to admire the resilience of all of the hundreds of people who took part in the Grande Tromenie in Locronan. All in traditional Breton costumes they walked for 14kms on the hottest day of the year so far. What made it more remarkable was they were wearing normal footwear, not walking shoes or lightweight trousers, there costumes were complete in most cases. They were followed all the way around by hundreds more people a little more suitably adorned for the walk. The circuit is left open all week for anyone to follow. We missed the morning ceremony and mass, when all the banners from the parishes involved, are paraded past each other and touch as if kissing to show the solidarity. 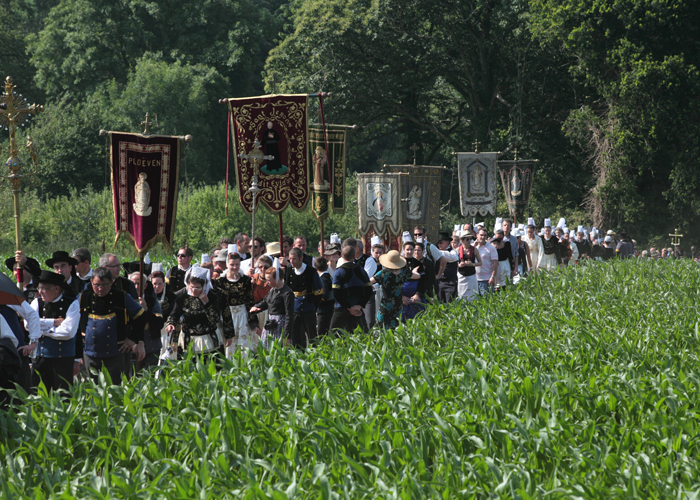 To arrive in Locronan centre with all the hundreds of participants and visitors for the start of the procession was very special. We arrived a little early and ate our baguette with a French couple who had invited us to sit with them at their bench. There were families everywhere enjoying their picnics in the sun.. The tromenie is Locronans version of many pardons held in Western Brittany. They are a form of catholic pilgrimage named after the patron Saint of the parish in which they take place. In Locronan, that is St Ronan who was an Irish pilgrim reported to have been responsible for several miracles. The Locronan tromenie is considered the most famous in Brittany. 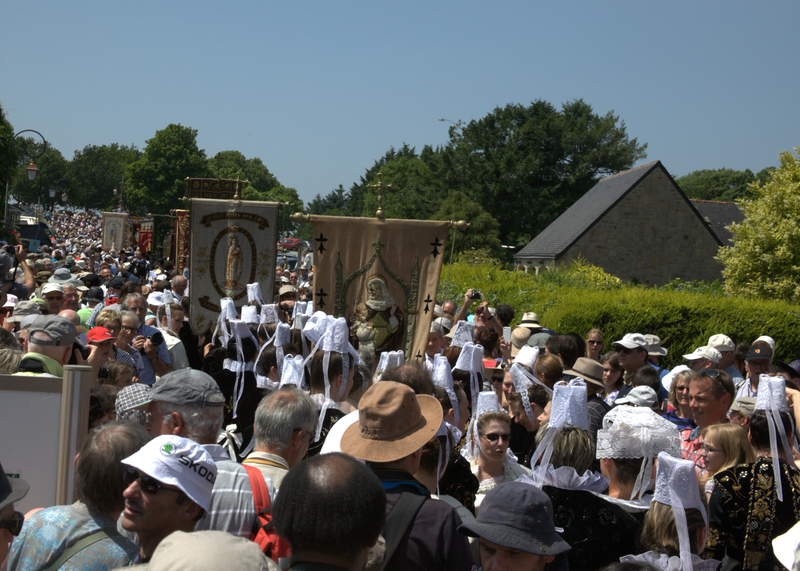 A smaller version is held for the parish each year covering 4kms whereas the larger one involves parishes from as far a field as Tréguier, Léonnais, Cornouaille, and especially from Morbihan. In the church of St Ronan we saw people crawling under his tomb. This is believed to ward off the devil. How wrong we were to assume someone had lost something. Whatever your religious beliefs, or not, may be, this is a truly remarkable event which you have to witness. I couldn’t believe that people in such numbers could cover such a distance in such inappropriate clothing, then, I remembered some of the participants in the London marathon. It did appear however, judging by the number of families with young children, that this isn’t a challenge you rise to, this is something you are born to do. Role on 2019 and we will certainly be returning to witness the smaller versions in between and maybe even walk the circuit. Nearing the halfway point of the procession. 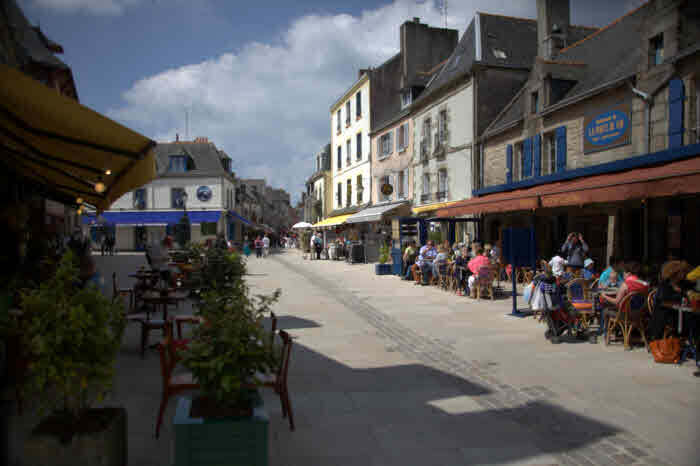 This is a port on the South coast of finistere in Brittany. It has two distinct parts; a modern town and harbour, which holds daily fish markets and several general markets on the quay, and the medieval Ville Close in the Harbour. One of the detective books “Maigret” was based here “Le Chien jaune” by the Belgian writer Georges Simenon. There is much speculation about the source of the towns name but the Breton name Konk Kerne means literally “bay of Cornwall”. It has nothing to do with Chilli Con Carni which is from a completely different part of the world. The Ville close is a small walled town accessed by a drawbridge in the harbour itself (although there haven’t been any lock-ins while we have been there. 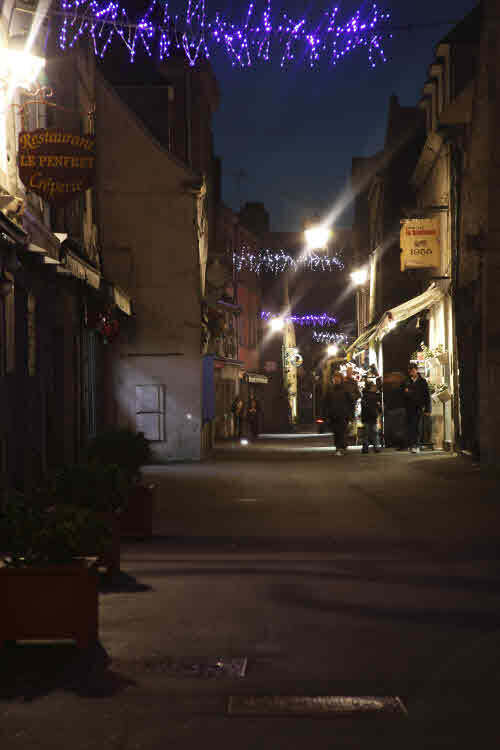 It has a main street full of interesting buildings crammed with shops, bars and restaurants. It manages to achieve a holiday feel without being spoilt. It holds a fantastic atmosphere with musicians playing in the entrance and an accordion player who visits a couple of the outdoor restaurants. There is also an open air auditorium at the end which hosts performances through the summer. It is not over burdened with tourist shops and retains its old world charm. Because of its sheltered aspect it is possible to be sat outside eating Crepes or Moules long after the summer has ended. 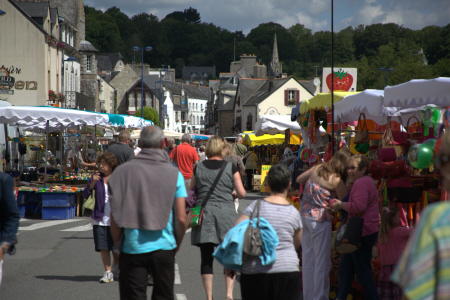 There is a fishing museum in the town and Concarneau is known for its traditional Blue fishing Nets which give rise to the “Fetes des filets Bleu” (A traditional festival full of Breton costumes and celtic music) which is held every August. 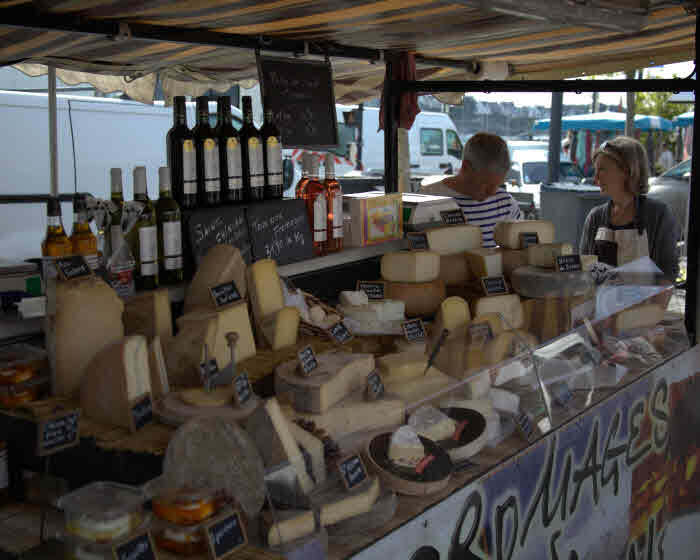 On Friday there is a large well stocked market which in the summer lasts most of the day and gives a flavour of traditional French markets. 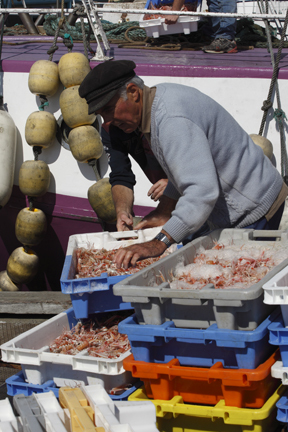 We have yet to visit the early morning fish markets, perhaps an addendum for later. It is a regular trip for us when we have friends and family or just when we want to experience its charm and unique atmosphere for ourselves in the winter months. Pont Aven – a place so good Brittany Ferries named one of their boats after it. 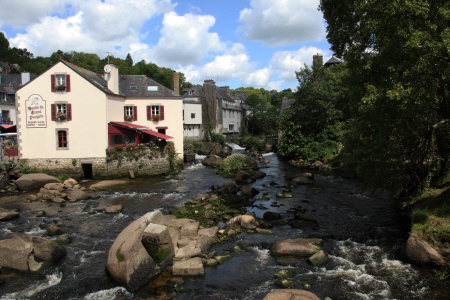 Following in the footsteps of Paul Gauguin the famous French Artist (admittedly about 120 years after him) we visited Pont Aven, just 40 miles South East of us in Finistere. Sitting on the River Aven at the limit of its tidal reaches it boasts a quayside, several old watermills and lavoirs (wash houses) along stretches of the river. The town centre is laced with waterways whichever way you look. We visited on a Tuesday when the market is held along the quayside. We walked through the stalls to the sound of two young French men playing guitar and singing in perfect harmony. The aroma of fresh spices, fruit and veg, meats – both preserved and freshly cooked – lead us past the clothing, leather goods and sweet stalls. Potatoes frying with garlic, onions and lardons promised us a great takeaway snack; which only gave way to crepes and a beer in a quayside restaurant when we discovered we had no cash and our only means of payment was a debit card. Well, sat outside in the sun sipping a Breton beer was a very good second best. After eating we walked back up through the town as the market stalls were closing, crossing the small bridge for some photos of the water mill restaurant. 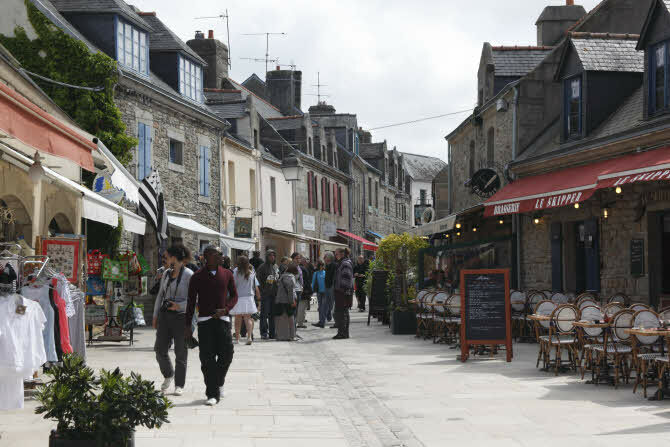 The evidence of Pont Avens artistic background is present, with virtually every other shop selling paintings and artefacts to suit all tastes. We assume from the lack of prices on the paintings that most of them would require the use of a credit card and so we stuck to window shopping. Due to the landscape around the town, as well as the beautiful buildings around the centre you are continually seeing interesting private houses set back on their own against the banks of the river, with neatly kept gardens. Behind the main streets you can lose yourself walking across small bridges and through ornamental gardens. Water is a constant feature, seeming to come pouring out of every conceivable gap in the walls. 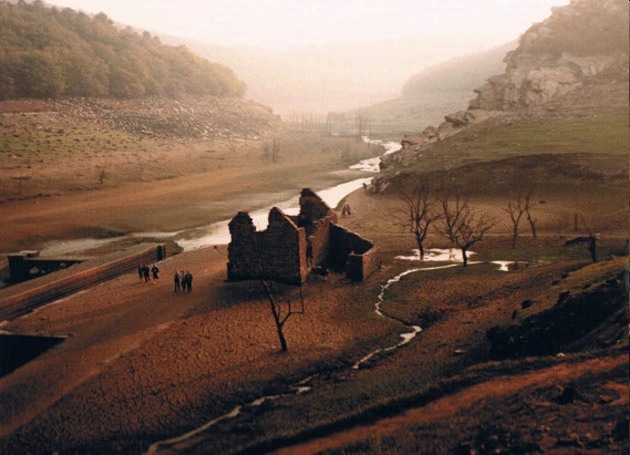 There are walks to view the old lavoirs on the sides of the river, as well as the old watermills. 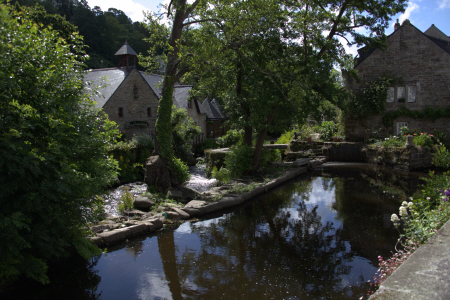 There are plenty of restaurants, cafes and bars to choose from, many with their own riverside gardens and vistas and one containing the workings of the watermill itself (apparently the only one which can still function). 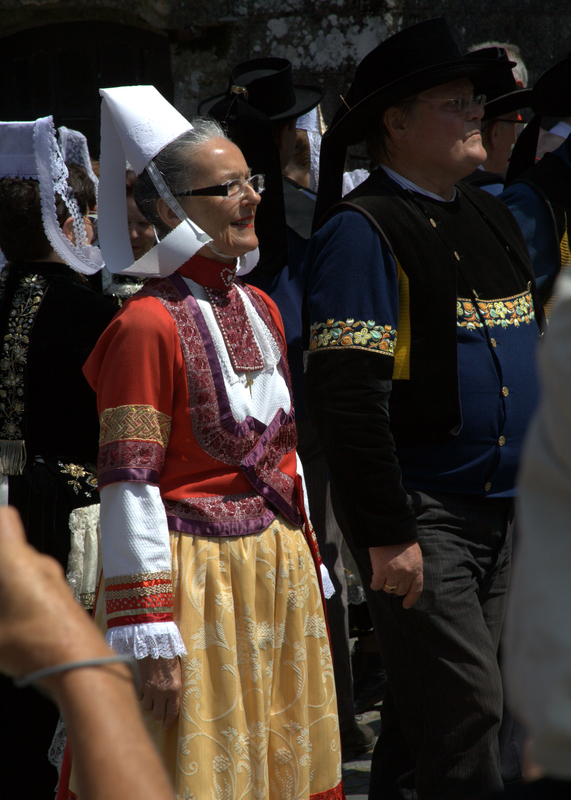 There is apparently a flower festival on the 1st of August each year including Breton music and dancing in traditional costume, which is said to be the prettiest in Brittany. Gauguin was post-impressionism; we were, well, just extremely impressed and will definitely Gau-a-guin. Pors Peron a beach to get away from it all. We decided on hot May Day to go and explore a beach that we hadnt visited before. Pors Peron is a very small beach a few miles west of Dournanaez. To get to it we went out through the pretty village of Poullan Sur Mer. The beach is accessed down a series of winding lanes and indicated by the smallest of signs pointing to The Plage The road eventually dropped down towards the beach and there were a couple neatly kept houses and what looked like it used to be a coffee shop. We parked in a small car park where there were half a dozen cars and a few more down the road to the beach. We were amazed as we walked onto the soft pale sand that there were only about 20 or so people enjoying the sun. The number of cars indicated there may have been a few more. I later realised the rocks on the west side of the beach are good for snorkelling as we saw at least two men in wet suits brandishing mask and snorkels. The tide was just starting to come back in as we arrived and there were one or two people in the water. I would imagine that on some days it would be not such a good place for swimming but certainly appeared to be a good place for splashing around in the surf. The coastal path passes along the back of the beach allowing the more adventurous the opportunity to wander off for a cliff top walk before returning for a picnic lunch or dip. All in all it is a great little place to visit if you want to get away from some of the busier beaches, (well as busy as they get in this part of Brittany). .like I did last month. However, Id like to share the experience of our local airports and flights. We are only 30 minutes from Brest Airport and 2.5 hours from Rennes and Dinard Airports. These three local airports are to Heathrow and Gatwick what the friendly corner shop is to an impersonal oversized, over-rated superstore. They are friendly faced and not in-your-face and as passengers you are treated as individuals. I measure these airports simply, on their customer services, their facilities and appearance. Its my rough guide. When I describe Brest Airport as being slightly bigger than Rennes, which is in turn slightly bigger than Dinard Airport, I am comparing simply what I see as a passenger, nothing technical or statistical.
. Brest is small and perfectly formed.
. Still after two and a half years living in Brittany, the childish puns using the name of this local city have yet to stop. Brest Airports modern, chic terminal building is spacious and bright, spotlessly clean and never crowded with a feel of calm and efficiency. Just a few small discrete shops, coffee-shop, car hire etc and parking is quite close to the main terminal building. I can describe Rennes Airport as just a little smaller but also perfectly formed with one shop and one coffee shop therefore, fewer opportunities to spend money but also smart, calm, spacious and efficient. Plenty of parking is available immediately outside the terminal building with quick access. Dinard Airport is my personal favourite. If an airport can be cute, this is it. I drove to Dinard Airport for the first time the other week. There are no visible signs of airport to be seen from the road and no apparent overhead traffic for clues. A small road sign casually directed me down little more than a country lane, at the end of which the even smaller, cute and perfectly formed Dinard Airport could be found. That was it. Simple. What you see is what you get. Like a large, well equipped coach station. The building has a dual purpose in/ out door, a car hire kiosk, toilets, refreshments and not much else. Staff and the passengers chat and look like they all know each other. Just like the other two airports you enter the building from the car park and leave the building on the opposite side to reach your plane and vice versa. No queues, corridors, tunnels or escalators. At Dinard the smiley lady at the only check-in desk guided me to Gate 2 (a door next to her) at which point Im sure she dashed behind the screen to the other side to become the boarding-pass lady. Dinard Airport is not chic, but the usual security checks took place with no time wasting; car parking is reasonably priced and all was friendly and efficient. My flight left Dinard five minutes early and arrived at East Midlands Airport nearly 30 minutes early. Impressive! quaintly tidy and the scene reminded me of children playing a well organised game of lets pretend. 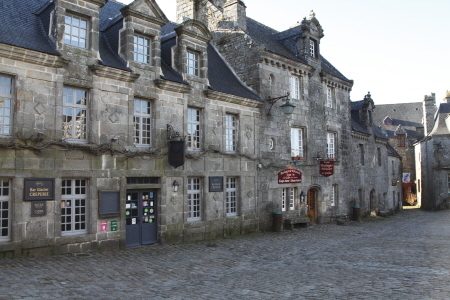 One of the wonderful things about Brittany is the old houses you see in all of the towns and cities in the region. So many medieval buildings have remained that you are spoiled for choice when visiting. 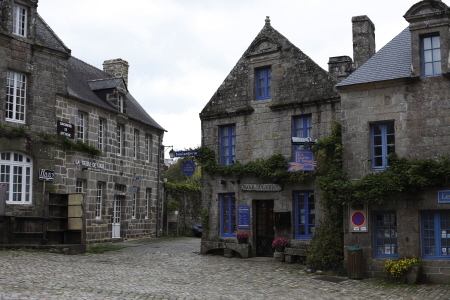 One of the best examples of this is Locronan situated just 30 mins from us, west of Quimper. In the 15th Century it thrived on the production of hemp for ships rigging and more particularly sails for the French, English and Spanish Navys. The beautiful old Granite and stone buildings include a church, a chocolatier, creperies and my personal favourite a cellar holding a wall of 100 Breton beers. The clue of the latter is in the name La Maison Des 100 Bieres Bretonne. 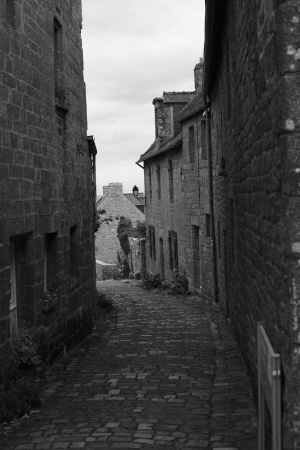 The centre is built around a cobbled square and has changed little in hundreds of years. Its character has been used for film sets including Roman Polanskis Tess and a beautiful French film called A Very Long Engagement. For me its charm goes well beyond the thought that Nastassja Kinski and Audrey Tautou have been there. The cobbled streets and quaint old buildings provide an amazing atmosphere for the camera and it is one of my ambitions to visit there early on a misty morning to capture the full drama. (watch this space). Every six years it hosts a Tromenie which is a pilgrimage festival involving surrounding parishes. Smaller ones (Petite Tromenies) are held on the second Sunday of each July between the major ones. The Tromenie includes a 12km procession taking in surrounding parishes. It is by all accounts (some of our visitors were fortunate enough to turn up by accident on the very day it was held in 2011) a spectacular event, but I dont recommend hanging around to wait 6 years for it. 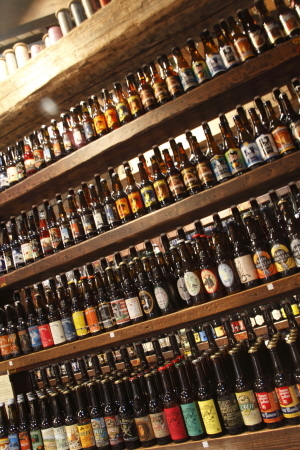 Mind you, it would give me an excuse to work my way through all the beers. For those who havent got six years to kill, there is a slightly less ambitious walk around the outskirts, which takes about half an hour, taking in another beautiful old Church with a modern looking stained glass window which is worth a look. In fact there are three walking circuits indicated on the tourist website, which include the town. One of 5.5kms, one of 12kms and one walk of 23kms for the really ambitious. The range of Creperies and restaurants in the town make it a great place to spend a day, parking is cheap, and free out of the main season. Locronan is classed as a Petite City of Character and is one of 19 in Brittany (I suppose the same as heritage sites in the uk). If you travel to this part of Brittany then Locronan is a must visit place. 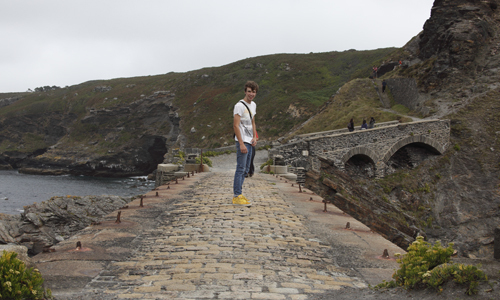 Coastal walk with an adventure if you want it. 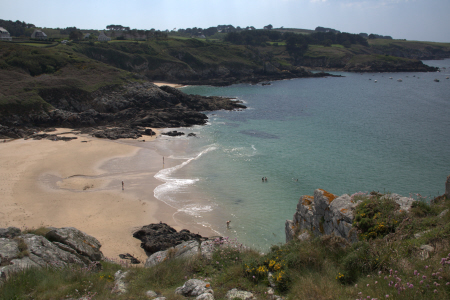 North of Camaret sur Mer on the Crozon Penninsula is the Pointe des Espagnols. This is the Northern most point of the Roscanvel Peninsula. It gets its name from Spaniards who landed there in 1594. They were dislodged after several battles and generally only return now as tourists (not the same ones in case anyone was wondering). This part of the coast has long been seen as an important strategic point in the defence of the Rade de Brest. There was a fort here as early as 1387. 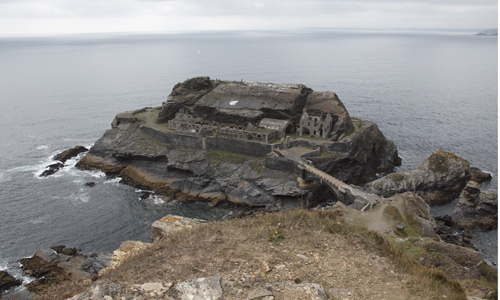 A walk along the coast from Camaret will find you passing several such fortifications. The most striking of these is on the Ilot Des Capuchins. 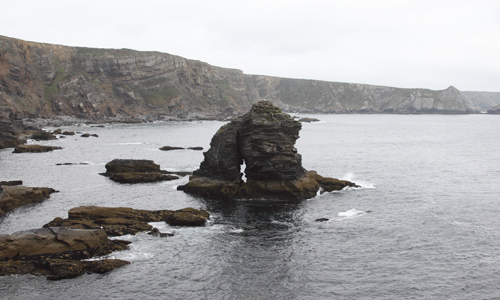 The Island gets its name for a rock nearby which resembles a praying monk. The fort was built in 1848 based on plans drawn up by Vaubin 150 years earlier. (from what I can gather he was the French military equivalent of Isambard Kingdon Brunel in that wherever you go you see testimony to his enduring designs). It consisted of an underground battery and rapid fire battery on the surface. 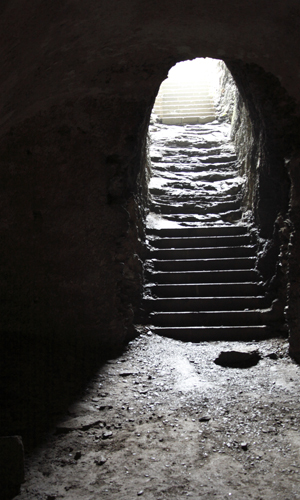 The beauty of this visit is that although it is a bit of a scramble you can explore all of it and even go underground to see where the canon were positioned looking out over the water. Would not personally recommend walking over the bridge to get to the island in a high wind as you are 50  60 feet above the water with no hand rails. The bridge is plenty wide enough and well constructed but not for the faint hearted. My Nephew Jo and I spent a long time exploring while the others looked down from on high, waving to the helicopter pilot who was circling them. (Probably waiting for one of us to fall in). 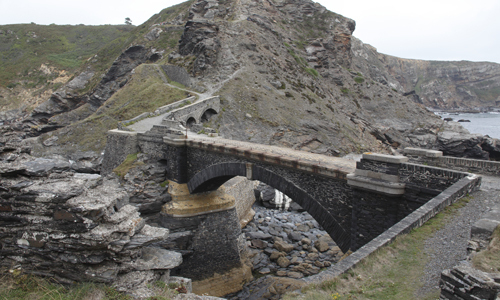 Access to this gem is down a narrow cliff track and the final descent on some steep slate steps which I imagine would be slippery in the wet, we thought we were intrepid explorers but as we were leaving a French family of three generations walked casually across the bridge. It is well worth a visit even if you only view it from the footpath at the top of the cliffs. On a warm still sunny day, go on, try an adventure. In England I am sure there would be barbed wire and signs preventing access. We are learning more and more that in France the choice of whether you take the risk and go a bit further is entirely up to you but it is your risk so dont expect to find someone to sue if you slip. The walk along the coastal path in this area will bring you in contact with many historic forts and stunning vistas along the cliffs. 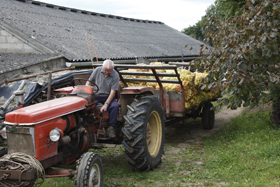 Below our Gites are two orchards owned by our neighbours Cathy and Herve. We have regularly sampled the products from them (Cider, Juice and Lambig which is similar to Calvados). We decided it was only fair that we would help with the picking this year now that we have finished the Gites. Claire kindly volunteered our services and then announced she was off to a Book exchange. 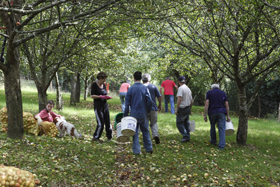 After Lunch I wandered down to the orchard where several of their friends were already gathered on their hands and knees helping our neighbours picking apples off the floor. 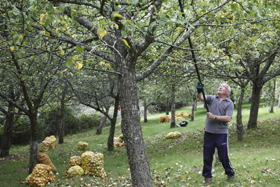 Herve and his son in law had been hitting the trees with a fibreglass pole and the apples were then collected and bagged up. This is a good year for fruit, even I know that from the pounds of Blackberries we have been picking and consuming recently. The trees were well laden with apples and each time the stick hit the tree there was a loud rumble as hundreds of apples hit the ground. Then again after another few thwacks, the ground resembled one of those childrens areas you see in McDonalds with all the plastic balls to crawl in (not that I have done that of course). We would then move in and move around on hands and knees with buckets to fill as quickly as possible. Then after a pause for a cider break we continued onwards until we thought we had finished. At this point much to the annoyance of his niece and nephew, who could sense victory was in sight, Herve would wander off and attack another tree. More apples littered the ground to be retrieved by the gang. Finally we reached the end of suitable trees for juice the rest are being saved fro the cider harvest in a few weeks. We had filled 63 bags by the end of the afternoon. We then loaded the bags onto the tractor so they could be loaded for transport in the morning. A few days later we were rewarded with a crate of bottles of apple juice that could be no fresher and the promise of more when we were ready. 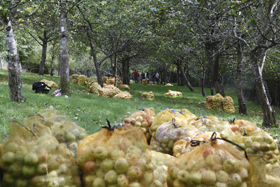 We had picked in the end 1600kgs of apples which had been converted into 1000 bottles of juice. Now I know what real apple juice tastes like I wont be able to view the supermarket offerings in quite the same way again. Heres to the cider harvest! One of the reasons for coming to Brittany was to be close to the sea and be able to pursue a fascination for all things nautical. A little while ago we went down to Le Guilvinec on the Southwest tip of Finistere, about a 40 minute drive from us. 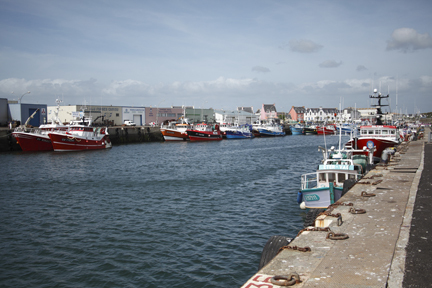 Its a fishing port which boasts a large fishing fleet and has made the unloading of fish into a spectator sport. It has a visitor centre where you can watch the catch being unloaded and the auction inside. We first visited on a Sunday when you can walk around the dock where they work on the boats. Its quite spectacular to walk under the huge vessels as they are supported for painting and repairs. 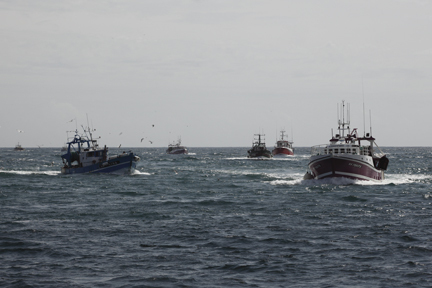 The rest of the fleet was all at anchor and it made quite a picture with the array of different colours on display. Just the other day we went back to watch the boats coming in and the spectacle was quite amazing. 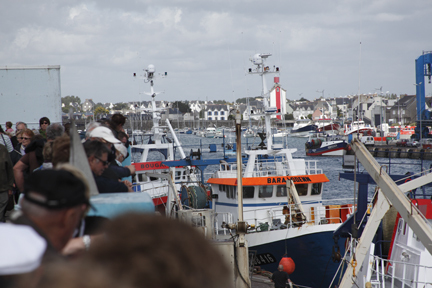 We joined lots of visitors on the viewing gallery above the larger boats being unloaded. These are the deep sea boats which take several hours to unload as the hold up to 25 tonnes. After a little while we walked along and down onto the entrance to the port. As we did, as if by magic, all the other boats in the fleet started appearing on the horizon as though someone had just blown a whistle. 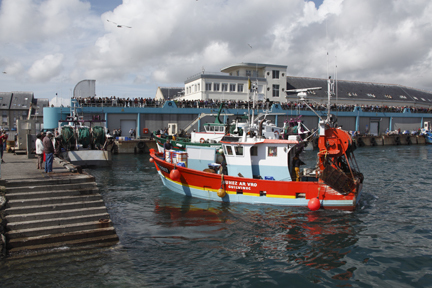 These slightly smaller boats came in twos and threes back into the port where they quickly unloaded their catch including Langoustines, crabs, red snapper and plaice to name a few. There was a throng of people gathered either watching or handing over cash to buy fresh crabs as quickly as they were passed from the boat. The whole Quayside was alive with boats moving to and fro and seagulls circling looking for the scraps. Several gulls would land and pick out the remains of fish still trapped in the nets rolled up on the backs of the boats. As the boats came into harbour many of them had seagulls sat amongst the aerial masts and radar like lookouts. The whole image, the sights, sounds and smell will remain with us for a long time. The crowds of onlookers gazing down from above seemed to add to the atmosphere of the place. I am sure it is somewhere we will be returning to often. I will be looking for those winter sunsets behind the returning boats as they arrive in the late afternoon/ evening, Claire I am sure will be looking for some fresh langoustines.